I believe in miracles, not the counterfeit kind you read about today but the real ones, the ones that are recorded in Scripture. I don’t know if you’ve ever thought about it this way but I am a Christian because of miracles. Let me explain. The ancient Bible writers and prophets had something important to say. In many cases it went against the accepted norms of the day. Sometimes their claims were so fantastic that they bordered on unbelievable even to those people who wanted to believe. Think about it. God told Moses that he would cause the most powerful man in the world to release his valued slaves and that he would then take those slaves into a land where they would conquer 6 mighty nations. Such a claim was absolutely fantastic and it took a burning bush to confirm the message (Exodus 3). 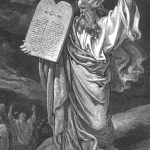 Soon Moses would repeat the claim to the enslaved Hebrews and would stand face-to-face with the Pharaoh and tell him to “Let my people go!” He would confirm it with miracle, after miracle. Miracles are real and have played an enormous role in our faith. Some people seem to think that miracles were done anytime a man of God wanted to impress someone or to heal someone. In fact, miracles were tightly controlled by the Holy Spirit and used to advance his own purposes. One key purpose was to confirm the message of inspired men, “and they went out and preached everywhere, while the Lord worked with them and confirmed the message by accompanying signs” (Mark 16:20). And, “…while God also bore witness bu signs and wonders and various miracles and by gifts of the Holy Spirit…” (Hebrews 2:4). Also, “And the crowds with one accord paid attention to what was being said by Phillip when they heard him and saw the signs he did” (Acts 8:6). Other passages could be offered but these show that one of the purposes of a miracle was to confirm the word being spoken. Certainly miracles helped the recipients. Jesus healed the lame, gave sight to the blind, cast out demons and raise the dead. But here is something interesting. Miracles did not help everyone. Paul struggled with a problem for which he could not find relief (2 Corinthians 12:7-10). Timothy was told to heal his problems medicinally, not with a miracle (1 Timothy 5:23). It seems that once the primary purpose of miracles had been accomplished – that is the confirmation of the word – miracles were no longer needed and they passed. That does not lessen their impact. Miracles are just as powerful today as they were 2, 000 years ago. It’s easy for skeptics to ridicule the miracles of the Bible. Just because they cannot be replicated today the infidel declares them to be bogus. However there are many things in life the we no longer have nor can replicate that we still believe in and hold to be true. The atomic bomb was unleased on Japan and has not been used again. As a practical matter it cannot be replicated at least not for mere demonstrative purposes. But we still believe in the power and horror of nuclear fission or fusion bombs. I don’t have to stand a ground zero to believe that they are destructive. I’ve recently been reading about the great physicist Albert Einstein. There has probably never been scientific mind so power as his. Einstein died in 1955. He can no longer be tested and his intellect cannot be studied. Nevertheless we accept his superior skills because of the evidence that remains of his work. This evidence is important and vital to the verification of Einstein’s skills and to the verification of miracles. A full study of the verification of miracles is beyond this posting but mounting secular evidence is accumulating which verifies the truth of Scripture in many areas. Some historical reports lend credence to the ancient Hebrew captivity stories even in the eyes of skeptics. The Flood was a great miracle as were the 10 plagues of Egypt. The crossing of the Red Sea and the Jordan River are stupendous. But it is a single event that seals my salvation, my faith and my future destiny. Jesus Christ was raised from the dead! The tomb remains empty. The discussion of the resurrection of Jesus is a great topic but too detailed for me to delve into here. But ask yourself a question: Why would the apostles all suffer and die for a fraud? If Jesus was not raised from the dead why would they pretend that he was. Where did it get them? Every apostles died by execution or torture except for John. John suffered imprisonment and torture himself although he did a natural death. But why? If Jesus’ death were fake why suffer? It is a question the skeptic has not been able to answer adequately. The resurrection of Jesus seals my fate because it assures me that I too will be raised one day (1 Corinthians 15). Yes, I am a Christian because of miracles! I hope you are enjoying our series. If you have not done so you can subscribe to our website easily. There is no charge. There is also a complete listing of all lessons in the 20 Reasons I am a Christian Series. I think you make a lot of sense. I just got over one chronic thing this year so far, and a few more are also dwindling to be a problem of the past. I'm looking forward to starting the whole detox program full fledged in July.